This review will be quite short, and the bottom line is that this disc is of very high quality. Avi Avital is clearly a superb mandolin player. All of the transcriptions and arrangements testify to his creativity and musicianship. Sure, the orchestral backdrop isn't the most thrilling, but nobody buys a Vivaldi disc for the accompaniments. While the disc is rather short by today's standards – and you can't possibly tell me there wasn't more Vivaldi out there – the whole project is good, clean fun. Deutsche Grammophon provides good sound and intelligent packaging. The encore – featuring renowned tenor Juan Diego Flórez – seems to be one of Universal Music's attempts to get a bunch of people together and make music casually. They did the same with Julia Fischer's Bach album, and it appears to be the industry's way of saying "We can do the impromptu jam session thing". My own opinion is that you ideally want musicians to have that kind of spontaneous chemistry with each other regardless of any marketing ploy. But that's just me. Elsewhere, there is restraint; only one of four Four Seasons is here, and there are certainly some inventive choices. 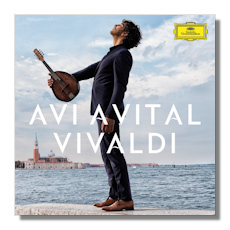 While the program strikes me as being better for background noise than for understanding Vivaldi's diversity and genius, Avi Avital certainly has great things to say regarding his instrument.